This past summer, Sean and I spent a lovely afternoon walking from Buckingham Palace through Hyde Park and Kensington Gardens, to see the Prince Albert Memorial and stop by to see Kensington Palace, William and Kate’s new home. This is a lovely walk, and a great way to enjoy an afternoon in London. Along the way, we stopped at the Serpentine Gallery, which has awesome shows, to see the Tea Pavilion, which is reconstructed annually in a new design by famous architects (we saw the pavilion by Sou Fujimoto). 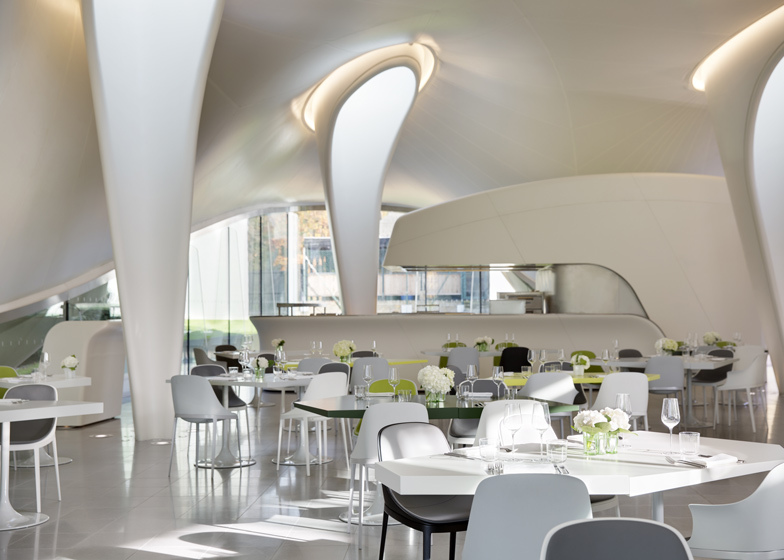 Now you can also enjoy the Magazine Restaurant by Zaha Hadid. This is a perfect way to see Hadid’s work up close, have a repose from your stroll, and appreciate great style. I love the mixing of colored chairs and table tops in the restaurant. The black, white, green, grey and yellow references the park outside while feeling terribly modern. This color mix is casual and fun, and I have seen this done is some of the most stylish places around. This is an idea worth incorporating into your own home or business.